This winter marks the end of a lot of eras. As we reluctantly say goodbye to Parks & Recreation, NBC is doing away with their legendary Thursday night comedy block, the sacred timeslots that one gave us Friends and Frasier, Will & Grace, Cheers, The Office, Scrubs, Mad About You, 30 Rock and many more. I’m still in as much denial as possible about that impending ending but on January 29th I was forced to come to terms with the fate of another network television institution- the family dramedy. With the end of Jason Katims’ all-star ensemble adaptation of the 1989 film, so ends an era of television drama that wasn’t afraid to bring the comedy, to wear its heart on its sleeve, to tell character-driven stories without Revenge-style melodrama or Rhimes-esque zeitgeist chasing. Anchored by insightful writing and superb, unflashy performances, Parenthood was the gold standard of the sort of earnest, non-reactionary, humanity-driven storytelling that most touches my heart. To say that I’ll miss it (especially in light of the likely cancellation of Katims’ other NBC gem About a Boy) is an understatement. There’s something special about a long-running series unafraid of its own sentimentality. 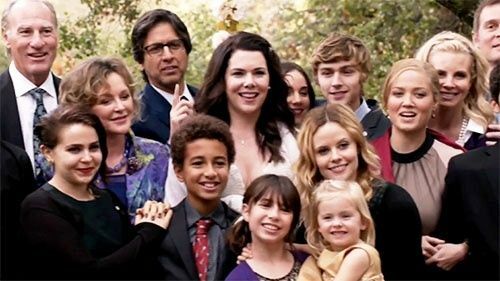 We were all somewhere dramatically different six seasons ago when Parenthood first came our way and that passed time is pointedly reflected in how far the Bravermans have come in that same span (spoilers ahead). Amber from a screwup teenager to a new mom, Max from a newly diagnosed kid with Aspergers to a confident young man dancing with a girl, Crosby from wanderer to creator, Sarah from lost to happy. We got to see the kids literally grow up (Sydney may never have gotten better but she certainly got taller). The unapologetic full-circle, “look how far we’ve come” model of a finale is surely not groundbreaking but it’s, in a lot of ways, the most satisfying (and full of montages; who doesn’t love montages?). Max develops a shoebox full of film found in his grandfather’s attic to uncover the very photos we’ve been seeing in the title sequence for a hundred and three episodes. Amber gives birth to the first member of a new generations of Bravermans and names her son Zeek (the Amber-Zeek relationship being consistently one of the series’ most intriguing) solidifying the “full-circle” inevitability of the moment in the finale when the family patriarch’s ailing heart finally lets him down for good. And we end, as we began, on a baseball game. Flashing forward to reveal the happiness in store for the characters (Amber marries Scott Porter- that’s a Running Back to Quarterback upgrade! ), the series’ final moments are set to (what else?) “Forever Young” (though a cover so it undercuts the cheesiness ever so slightly) as they scatter Zeek’s ashes and play an adorably haphazard game of baseball. It’s directly reminiscent of the ending of Band of Brothers, one of the single greatest endings I can think of. Perhaps there’s nothing as quietly beautiful as (“as a testament to his character, sixteen hundred people attended his funeral”) but Zeek’s final celebration was perfectly Parenthood in all its honest, earnest, human glory.